I am d.e.a.d. after this weekend. That thing I had to throw was a success and now I am bracing myself for another blitz of a week. That being said I can barely feel my eyeballs let alone think. While I was in crazy mode last week I found slivers of calm. This usually happened while in the shower or in the subway. In the shower I would listen to WNYC and in the subway I would read The New Yorker. Both are quintessentially New York things as the pledge drives say so it was a sheer surprise and delight when one of the critic’s pieces in the recent issue of The New Yorker featured Mixpack (a music label based in Brooklyn) and one of its artists Palmistry. 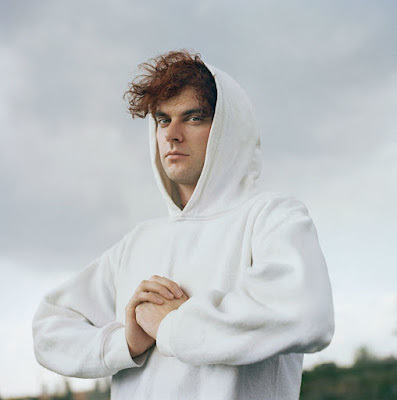 Palmistry (Benjy Keating) is one of my favorite musicians for the past ~2 years and he is based in London. When I moved there last-last fall I made it a self-anointed point to meet him come hell or high water. Luckily I linked myself in with certain crowds and he is friends with them so yes I did meet him. I was too shy and trying to be too cool to actually say how much I liked his music so instead I just stared at him and nodded my head a bit and said “hi,” then immediately turned around to avoid complete embarrassment. Anyways, it doesn’t matter that I met him or that he and I were in the same room/party many a night. I think it is always better to keep at a remove those who you “like” in an artistic way to some degree. But ya, seeing him in The New Yorker while riding in the M train to work made me smile and feel happy because the world felt both wonderfully large and small. Below is the article in full. It is well written by Carrie Battan and for those that don’t know/haven’t listened to Palmistry, find, download and take some time to listen to it. It has been the backdrop to my life on many solitary walks. In 2012, Snoop Dogg set out to refashion himself as a Rastafarian named Snoop Lion. He travelled to Jamaica, where he called on a number of artists to help grease his transition. In a three-week recording session for an album called “Reincarnated,” he worked closely with Diplo, the swashbuckling d.j. who spearheads the dance-pop group Major Lazer. The pairing seemed natural: Diplo had the Midas touch as a producer and was becoming a star in his own right, one who had built his reputation chiefly by playing the role of an outsider turned liaison to Caribbean music. But Snoop also enlisted the help of a soft-spoken d.j. and producer named Andrew Hershey, who has developed a standing as a kind of anti-Diplo. Although both musicians are white American men who are fascinated by far-flung cultures and sounds, Diplo has used his access as a platform for success and celebrity, while Hershey has remained a background figure. Diplo transcends his outsider status with brazen force; Hershey, who performs as Dre Skull, tends toward assimilation, dutifully experimenting within the existing framework of reggae and dancehall music. In the years since Mixpak launched, its catalogue has grown to include a wide range of styles—the label is home to an all-female Japanese post-punk band called Hard Nips, as well as to a suite of club-minded electronic musicians—but it has focussed on dancehall, reggae’s thunderous digital stepchild. Hershey describes his path to the genre as serendipitous, a logical extension of his longtime obsession with hip-hop. With Mixpak, he has assembled a cross-cultural, high-low list of records from established heavyweights, like Kartel and his softer-sounding protégé Popcaan, along with lesser-known and more outré newcomers intent on upending listeners’ expectations of Caribbean music. Mixpak is surely the only label that offers a raucous Beenie Man single and an ambient electronic producer from New York on the same SoundCloud feed. The label has become such an exalted brand that unaffiliated dancehall artists have released music with fake Mixpak stamps attached. At one extreme of the Mixpak spectrum is Benjy Keating, a young producer and vocalist from London who sees dancehall music through a long-focus lens. His début album, “Pagan,” released under the name Palmistry, offers a hyper-specific version of the genre. It feels almost like a hallucination—blurry but vivid, its sorrow and pleasure twisted tightly together. The songs are dancehall tracks distilled to their bare essentials, with the music rarely consisting of more than a plasticized synth line of buttery chord progressions and a spare bass drum. Anything more would overpower Keating’s voice, a feminine lilt that hardly registers above a whisper. The result is a sense of hushed intimacy, and yet Keating keeps the listener at arm’s length, perhaps out of necessity. He is cognizant of the complications of being a white British guy singing dancehall, a situation he tiptoes nimbly around by obscuring himself, slipping in and out of a light patois, using Auto-Tune, and varying his phrasing until the meaning of the words begins to drift into oblivion. Sometimes disarming lines will float to the surface: “Daddy was a pastor / Mommy was a pastor / Son, son was a pagan,” he sings on “Paigon,” one of the only moments on the record that reveals biographical details. “Pagan” is less a collection of songs than a slow-moving accretion of sensation. Keating is not concerned with trying to replicate any one style of music; instead, he explores what happens when he takes familiar elements—in this case, chord progressions and rhythms burned into our senses by dancehall and soca—and presents them in an uncanny way. The result is often quite affecting, an emotional blend of recognizable and alien pop music. At the album’s heart are sorrow and loss. On “Sweetness,” the stickiest and most conventional pop track, Keating reels off a list of enticing sensory details: smoke, silk water, jasmine, blood amber, bubbling tea, blackberry cream, cinnamon sheets. “The sweetness is a malady,” he sings, on one of the album’s rare choruses. “The sweetness / I love your malady.” Given Keating’s accent and the airiness of the album, it’s easy to hear this line as “I love your melody.” There’s a darkness to his sound that suggests that joy and affliction are not unrelated. “Pagan” has a meditative, hymnal quality; its songs could work well as background music at a spa, at a dance club for shy people, or as objects of study in a semiotics seminar. It is a dancehall record at heart, but it’s not the product of nostalgia or respect for tradition. Rather, it’s born out of the hungry energy of someone realizing that the elements of long-established styles are at his fingertips, available to be remolded. And yet the effect is never parodic—when Keating sings a line such as “Do the wine like it’s happy hour,” he’s sombre and worshipful enough to avoid sounding silly. There was a period in the early and mid-aughts when dancehall artists carried their own water in the American market. With the help of the major labels, Jamaican musicians like Sean Paul, Sean Kingston, and Elephant Man broke into Top Forty radio. You couldn’t go a day in the summer of 2003 without hearing at least one single from Sean Paul’s irresistible pop-dancehall album “Dutty Rock,” two of whose songs hit No. 1. Unless you count Rihanna’s mush-mouthed Bajan triumph, “Work,” which had a recent stint at No. 1, those days are behind us. Today, Caribbean styles are used in pop music like giant sandwich boards, announcing an American pop star’s desired effect in crude block letters: Here is a summery song. Here is a light song. Here is a song that is designed to make you feel happy. Take twice a day with sun. But reggae and dancehall are especially fluid genres, well suited to experimentation. Artists like Palmistry and others on the Mixpak roster show that Caribbean music can be more than a loud statement piece to be discarded at will—it can be a foundation for a new sound. The clever Egyptian-Canadian singer Ramriddlz, on his new EP “Venis,” has melted down these styles to a sensual syrup, swirled with cheeky lyrics and hybridized slang. (In the earlier age of playful new genre taxonomy, someone might have named this “Reggae & B.”) A few months ago, his breezy single “Sweeterman” captured the attention of Drake, who proceeded to release his own version. Drake’s unofficial riff attracted millions of listens on the Internet, both accelerating and muddling Ramriddlz’s trajectory. Drake, in fact, has demonstrated a keen and growing curiosity about Caribbean music, owing partly to the influence of the many immigrant enclaves in Toronto, his home town. For Drake, dancehall has been an effective way to raise the temperature and the mood of his otherwise chilly, downcast style. He has also used the vocabulary of dancehall to shield himself from accusations of theft. When asked in an interview to explain his use of the rapper D.R.A.M.’s track “Cha Cha” on his hit song “Hotline Bling,” Drake invoked the “riddim,” the tradition in which Jamaican artists endlessly iterate on a single rhythm. “In Jamaica, you’ll have a riddim, and it’s, like, everyone has to do a song on that,” he said. “So sometimes I’ll pick a beat . . . and I just try my hand at it.” Weeks before the release of his new album, “Views,” a track called “Controlla” leaked online. That version of the song, a sweet spritz of dancehall, sampled a Beenie Man track from 1995 and featured a verse from Popcaan, Mixpak’s marquee Jamaican vocalist. But by the time “Views” came out the Popcaan verse had been discarded, the limits of a pop heavyweight’s curiosity plain to see.